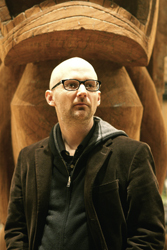 Moby is in Toronto for a celebrity interview tomorrow at 5:15 p.m. in the Royal York Hotel Ballroom, as part of Canadian Music Week. I caught up with Moby for a brief interview of my own yesterday afternoon at the upscale This Is London club where he's doing a DJ set tonight. For a preview of Moby's new "Last Night" album, you can download the almost nine-minute long Album Mash Up Mix for free off his website. This new album, Last Night is a concept album of sorts, taking the listener through a night out on the town. How did this come about? "I have a little studio on the lower east side. When it comes time to making a record, one of the biggest questions I face is what kind of a record should it be. In the neighbourhood where I live, there are so many bars and clubs and I go out all the time. So I really just wanted to make a record that sounded like a night out in New York -- a night out in New York in 2008, but also in 1990 or '91. "Dance music is going through a very playful, nostalgic period now. Most of the DJs and producers I know aren't really so concerned with when it was made, but how people respond to it. I like that almost temporal eclecticism. So I wanted to make a dance record that, to me, felt like a night out in New York." How has a night out in New York changed over the years? "In the mid- to late '80s New York was a really dangerous place and it was really ravaged by crack addiction and HIV-AIDS. Nightlife was kind of insane. Almost every time you went out, you heard about someone else who had died either of an overdose, someone had died of AIDS or someone was shot. It was a weird time to come of age musically. "Now, going out in New York is fantastic. The only problem is it's so expensive. Probably not for Canadians, because the dollar is better. It's almost a victim of its own success. There's so many places to go. You go out to the lower east side, or Williamsburg, or anywhere downtown on a Thursday, Friday or Saturday night and it's like Mardi Gras. The streets are just filled with people. On one hand it's fun, but it can be a little overwhelming. What's it like DJing in front of a club crowd? "Sometimes if you're just DJing, you can become a little too self-involved and you forget that there has to be a populist, utilitarian element to DJing, because ultimately you're playing music for other people. I know some of my friends who are DJs sometimes forget that and just play records for themselves. I think I'm more of a populist. I really like the idea that I play records that make people happy." What's your experience of Toronto like? "The first time I came to Toronto was in 1992. I was playing a rave at an old Masonic Temple (a.k.a. The Concert Hall, now owned by CTV). I remember Joey Beltram was on the bill and some other rave acts. "Toronto's one of my favourite places on the planet. I love it here and I'm not just being nepotistic. I really do love it. Every time there's an election in the States and a right-wing politician wins, it makes me want to move to Toronto. "Only two things have kept me from living here. Number one, all my friends and family are in and around New York. And also -- not to sound too much like a sissy -- but the cold does start to get to me. "Toronto is such a great city. It's got so many of the nice elements of New York: It's big, it's cosmopolitan, it's multicultural and multiracial, but it's a lot more progressive. New York is progressive as well, but the United States is a lot more conservative and right-wing than Canada is." Tonight is also This Is London's two year anniversary. Their Soho Fridays night includes Manzone & Strong DJing. Expect Moby on around 1 a.m. Doors open at 10. Get there early to avoid line-ups and be sure to dress to impress as their "English style code" is in effect. This means no jeans or runners and collared shirts are a must for guys. Let's hope Moby doesn't get bounced at the door.